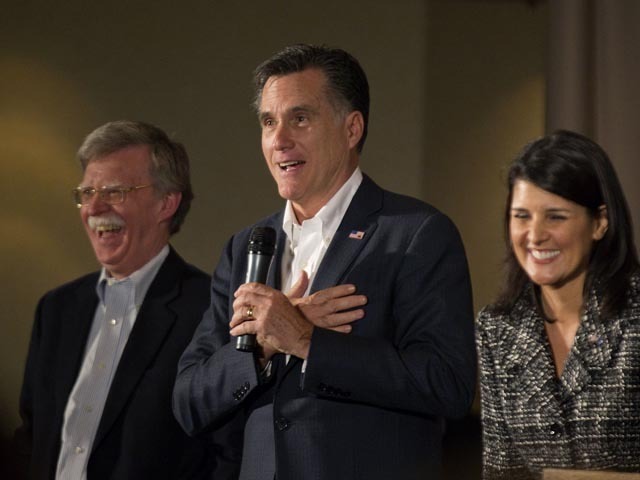 HILTON HEAD, S.C. - As Mitt Romney's newest foreign-policy surrogate, former U.N. Ambassador John Bolton made it immediately clear Friday that he's prepared to be one of the fiercest attack dogs of President Obama's foreign policy. "He's not only the most radical president in history domestically; he is the first president, Republican or Democrat, at least since Franklin Roosevelt, who didn't get up every morning thinking first about what threats the United States faces," Bolton said of Obama to an audience here. "He just doesn't care about national security the way other presidents did." Bolton endorsed Romney earlier this week. In touting the former Massachusetts governor's candidacy, Bolton said voters "want a president who has judgment, who has steadiness of purpose, who has leadership, who won't falter in a crisis, and who doesn't believe that the role of America in the world is to be a well-bred doormat." Bolton - who flirted with launching his own presidential bid last year -- also contended it was the military, not Obama, that deserved credit for killing Osama bin Laden. "You know, the irony is, he's campaigning on the basis that he's a success as a foreign policy president," Bolton said. "It's just really amazing and you ask, What is it that made the success? And it's because Navy SEAL Team 6 killed Osama bin Laden. That's his definition of success. As somebody pointed out, in 1969 when Americans landed on the moon, it's like Richard Nixon taking for credit for that, because it happened to occur during his presidency." Sarah B. Boxer covers politics for CBS News.